The Minneapolis Charter Commission will consider a proposal this afternoon that would alter the city council ward boundaries in the Lowry Hill District as part of the city-wide redistricting process. As proposed in the boundary plans dated March 26th, ward 7 would include the west side of Hennepin Avenue from Lake Street up to the Walker Art Center / Loring Park area. Ward 10 would include the east side of Hennepin Avenue. Currently, ward 7 includes the area on the west side of Hennepin Avenue north of 22nd Street, with the 10th ward including the west side of Hennepin south of 22nd Street and all of the east side of Hennepin. At present, Ward 7 is represented by council member Lisa Goodman and ward 10 is represented by council member Meg Tuthill. The mayor and all 13 city council seats will be up for reelection in 2013 based on the ward boundaries that the commission adopts. The ward maps were last redrawn in 2002 following the 2000 census. 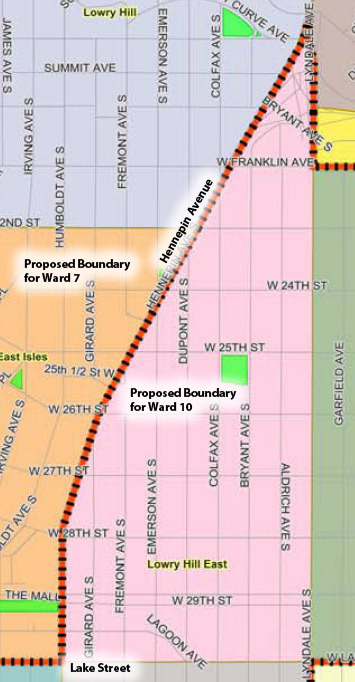 Prior to 2002, the ward boundaries along Hennepin Avenue were similar to those now being proposed with the Ward 7 on the west side of Hennepin and Ward 10 on the east side of the street. UPDATE MARCH 28, 2012: These boundary maps were ADOPTED as drafted by the Charter Commission at its March 27, meeting so these are the new ward boundaries. Click here to open PDF of adopted Ward 7 map. Click here to open PDF of adopted Ward 10 map. Click here for further information about redistricting.